then on my way home about 5 minutes later i get pulled over again and the cop comes up and guess what it was the same cop that drove threw the tims earlyer. he says somthing about i dont have a sticker saying "RIGHT HAND DRIVE". anyways he didnt give me a ticket...he didnt even know where too get such a sticker himself he suggested i make one...soo anyone know of a place that makes decals im gonna get somthing that says RHD PIMPIN or somthing he said it can go anywhere on the car or is this sum bull**** this is the same cop that gave my buddy the ticket for his headlights as well dam cop harassing people. and my car has signals soo the cops IS IN FACT STUPID!!!!!!!!!!!! there you go marker i found a STUPID COP! Mechanical or electrical signal means a device that will either pops up (like a school bus stop sign) or lits up (like your brake light) to show the words "Right Hand Drive Vehicle". The said "signal" is not your left and right signal. 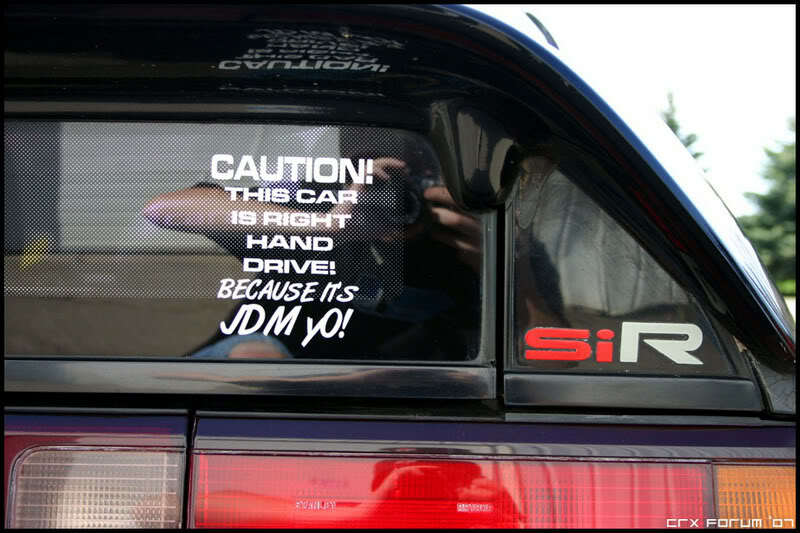 Since your MR2 has neither, you have to make a vinyl sticker that says "Right Hand Drive Vehicle" and stick it on the back of the car. A RHD vehicle has a difficult time making a left turn at intersection, the fact that you can't see the on coming traffic sometimes in a LHD vehicle because a truck or a larger vehicle is across from you shows how dangerous it is. You don't make the turn because you "assumed" there are no on coming traffic, you have to make sure that there isn't. So when the car behind you sees no one coming but you ain't moving because you can't see any (and no RHD sticker to indicate your inability to see beyond the blind spot) is in fact, interferring and blocking the intersection which, if I am correct, is also not allowed. Being pulled over doesn't mean being harassed. There is a reason why a person gets pulled over. Also, the chances of seeing a police officer on a daily basis is fairly minimal - even if you drive by a station but the cars are still stationary. Timing also plays a factor. Police is not always right, no one is perfect. But when he pulls out the regulation and was kind enough to give you a pointer and guides you to the right direction to avoid future tickets, I think you ought to be thankful. And you mentioned you are 18? There is a lot to learn ahead of you, I suggest you do so with an open mind. A mechanical or electrical signal device shall clearly indicate the intention to turn, shall be visible and understandable during day-time and night-time from the front and from the rear of the vehicle for a distance of 30 metres, and shall be self-illuminated when used at any time from one-half hour after sunset to one-half hour before sunrise. R.S.O. 1990, c. H.8, s. 142 (6). Somehow I have a feeling that you will give them more than enough opportunity to even the score and then some. CRXXX you are completely right on this one. aslong as you have flashing lights indicating which turn your making you are fine. take it to court and show him how stupid he is BTW chances are he wont even show. this CRX SiR's sticker is great!